"The Double Road Race is the only running event with a halftime," says creator Bob Anderson. "When Bob was 17-years-old he started Runner's World magazine and built it to a circulation to 435,000 before selling it to Rodale Press in 1984. In 2012, Bob at age 64, ran 50 races (350.8 miles) and averaged 6:59/mile. "He placed first in his age-group in 31 of these races which ranged from 2 miles to the half marathon. A movie called "A Long Run" covering this adventure is in works and is planned to be premiered in December 2013," says director Michael Anderson. "I think the Double Road Race is going to be the most important thing I have ever done," thinks Bob Anderson. "We have created a new sport that offers a challenge that is doable for runners at all levels." There is no better time for companies to get involved and stand out from the crowd. "This is going to be big," says Christine Kennedy. Christine is the only 56 or older woman in the world to have run under three hours for the marathon. Get Involved In This Exciting New Sport! Only in a Double must a runner strategize what to do during the halftime of a race. Considering how to ration your time in the Recovery Zone is an important aspect of the Double Road Race®. Our partners play an important part in our race - and, in particular, the Recovery Zone! In our marquee event, the Double 15k, the 5K leg starts 105 minutes (1 hour, 45 minutes) after the start of the 10K, which means that during the Halftime, runners may have up to 75 minutes to be exposed to massage, stretching, etc. ; they can get an adjustment from a chiropractor, or use an elliptical machine while getting advice from a fitness trainer. The Halftime gives our partners an opportunity to connect with each of our runners and share what they have to offer. This unique aspect of the Double Road Race® brings forth an added value to our sponsors that's unlike anything available at any other running event. 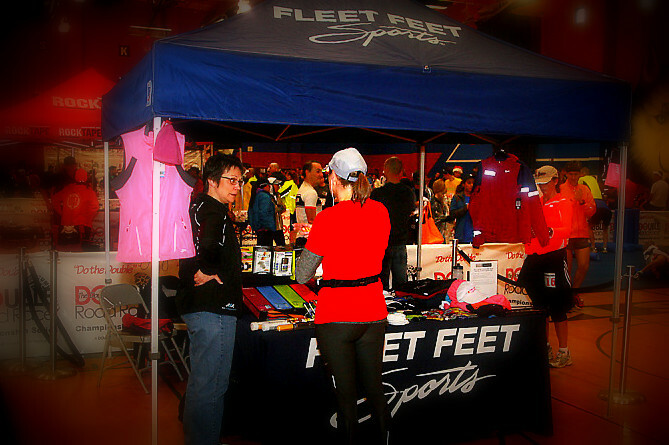 If you would to be a part of our event and feel you have a valuable service, product or skill that our runners would appreciate, contact us below to learn more about our sponsorship opportunities. The Double Road Race Federation will produce all Double Road Races, keep records and statistical data, and oversee the sport. A Leader Board for the year will be maintained and prize money awarded to the top 10 male and female runners at the end of the season. From a sales and sponsorship standpoint, as the sport of Double Road Racing grows to hundreds of races worldwide, having one organization overseeing all aspects of the sport will allow us to give our corporate partners the greatest return on their investment. Get in on the ground floor and take advantage of all the opportunties we have available. The demographics of our competitors are impressive. Sponsors help make our events possible. Thank you for helping make the Double Road Race® the greatest event! If you wish to sponsor multiple Doubles, please use the form below. You may also use the schedule links to sponsor an event in your area. Please provide your contact information in the form below and a representative will contact you as soon as possible. Your personal contact information is considered confidential and will be kept private. Please do not include a Web address or URL in any field on this form (except for the Website field), or your information may be disregarded by our automated detection systems. Comments Let us know about additional sponsorship opportunities you are interested in. Also, please do not put any Web links or URLs in the comments section.